Abstract helper base class to access JPEG images. Constructor that can either open an existing image or create a new image from scratch. If a new image is to be created, any existing data is overwritten. create Specifies if an existing image should be read (false) or if a new image should be created (true). initData Data to initialize newly created images. Only used when create is true. Should contain data for the smallest valid image of the calling subclass. dataSize Size of initData in bytes. Determine if the content of the BasicIo instance is of the type supported by this class. The advance flag determines if the read position in the stream is moved (see below). This applies only if the type matches and the function returns true. If the type does not match, the stream position is not changed. However, if reading from the stream fails, the stream position is undefined. Consult the stream state to obtain more information in this case. iIo BasicIo instance to read from. advance Flag indicating whether the position of the io should be advanced by the number of characters read to analyse the data (true) or left at its original position (false). This applies only if the type matches. 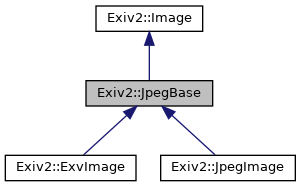 Implemented in Exiv2::ExvImage, and Exiv2::JpegImage. Writes the image header (aka signature) to the BasicIo instance. oIo BasicIo instance that the header is written to.